If you want an inspirational story about a brewery that pulled itself up by its bootstraps, you need look no further than Goose Island Beer Company. In 1988, John Hall opened the first Goose Island Brewpub, at Clybourn and Sheffield on the north side of Chicago. Though essentially in Lincoln Park, the brewery is not all that far from Cabrini-Green, which at the time was easily the most unsafe part of the northside. Over the years the brewpub built a community of beer fans and simultaneously played an instrumental role in revitalizing the surrounding neighborhood. By 1995, the brewpub had grown enough that Goose Island opened the brewery on Fulton Street. This is the facility that currently produces all the company’s bottled beers. They have since expanded further, opening a second brewpub on Clark Street, half a block from Wrigley Field. Each of the two brewpubs produces their own specialties and unique creations. After a deal with Widmer (wherein Goose Island brews are sold by Anheuser-Busch distributors) the beer is now available nationwide, and also in England. It seems the plan has paid off, for in the last three years they have grown from 37th largest brewery to 22nd. Goose Island produces five year-round beers: 312 Urban Wheat Ale (one wonders what exactly “urban” means here), Honker’s Ale (a regular bitter), India Pale Ale, Nut Brown Ale (formerly the more inspired Hex Nut Brown), and Oatmeal Stout. They also brew a variety of seasonals (some with more interesting names) and their acclaimed special reserves. Among the most sought-after craft beers these days is their Bourbon County Stout, a bourbon-barrel aged imperial stout that sells for upwards of $5 per 12 ounce bottle. Tonight I will try three others of the brewmaster’s specials: the Belgians Matilda, Sofie, and Juliet. 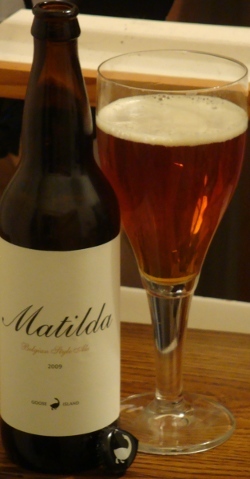 Matilda used to be brewed with Brettanomyces wild yeast. It is my understanding that they now only bottle with that infernal bug. It pours the color of a persimmon, crystal clear despite warnings of “a sediment”. The lace-inducing off-white head is not nearly voluminous enough. Matilda has a delicate fruity nose: mostly raspberries, cherries, and honeydew. There is a little spicy aroma and some clean malt as well. Perhaps some roses in the background. The taste is spicy with yeast character. A noticeable alcohol warming supports the peppery flavor. There is some strange fruit and caramel. A little dustiness and that strange fruit are all I get from the Brett. A bit of hop bitterness seems present but is quickly gone. Tastes just a little flat. Officially it is “dry and quenching”, but I don’t find it either. There is a prominent sweetness that turns cloying, leaving a coating on the tongue accompanied by a lingering astringency. Don’t drink this one now; sit on your bottles for two or three years. 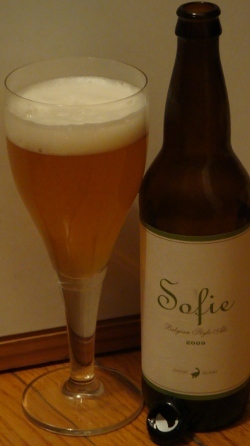 Twenty percent of Sofie has been aged in wine barrels of undetermined varietal on a bed of orange peels. This has been blended back with the unadulterated version to yield a barely hazy, barely yellow brew. A decent amount of creamy bright-white head leaves a thick lacing on the glass. The nose is of orange peel, almost to the point of smelling like Gojo. Actually, it has the exact aroma of fermented Mountain Dew (not that I know that at all). The taste continues the citric bomb with a tart lemon flavor. At first that character makes it seems like a Berliner weisse, but it is not nearly acidic enough and much too sweet. The lemon yields to pepper and a malt flavor. The sweetness lasts throughout and lingers on. This is a highly regarded beer, and frankly I don’t understand why. The flavor is flat and the sweetness cloying. As my brother (who likes it) said, people must like Mountain Dew more than I. 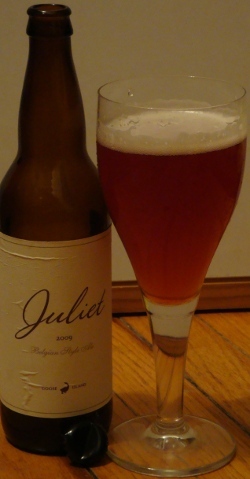 Finally we get to Juliet, an aptly-named sour, aged in wine barrels of indeterminate variety on blackberries (at one point they were using gooseberries). Juliet is an opalescent burnt orange with some white head. The nose is deep. Fruit dominates the first level, mostly pie cherries, dates, blackberries, kiwi, and raisins. Then comes a dusty, barnyard sweetness. Deeper yet is a rich balsamic vinegar character. A complicated and intriguing aroma. The flavor is likewise complicated. Seriously fruity at first, the sour character soon comes out. Berries, pomegranate, and a little more exotic fruit are present. A lemon tart and balsamic vinegar sour add a rich complexity. Some caramel flavor attempts a malty coup but the acidity fights on. The flavor continues to develop on the tongue for several minutes, eventually resting as a latent astringency. The sweetness and acidity balance each other initially but they both linger a bit long. An otherworldly berry taste is really the star of this beer.